I have a confession to make to Billboard and LG ... I, uh, used the camera phone for my Chicago sightseeing as well. Hope you don't mind ... 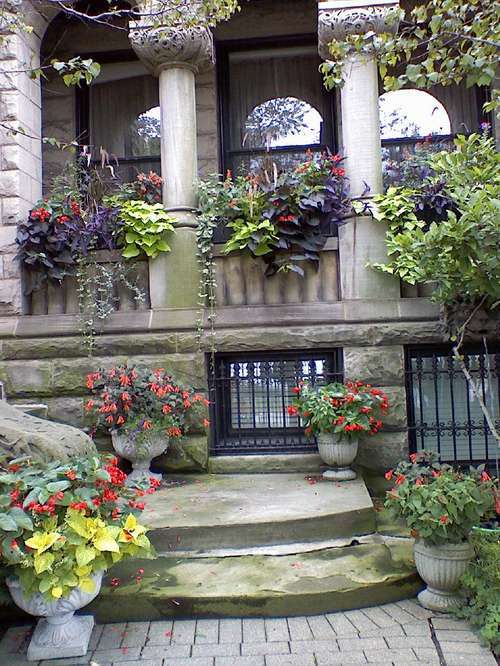 Here are a few of the photos I took around Chicago -- which is a really beautiful town, full of gangster history, interesting architecture and gorgeous flowers. Somebody had the bright idea to modernize the "historic landmark," with its classic Roman columns, by placing a silver, spaceship-like structure inside the existing facade. 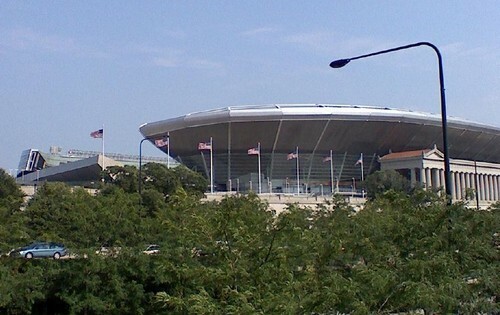 I defy you to look at this place now without scratching your head and saying, "What the #&%@ were they THINKING?!?" No trip to Chicago would be complete without a trip to the impressive Field Museum to see "Sue," the largest and most complete t-rex skeleton ever discovered. 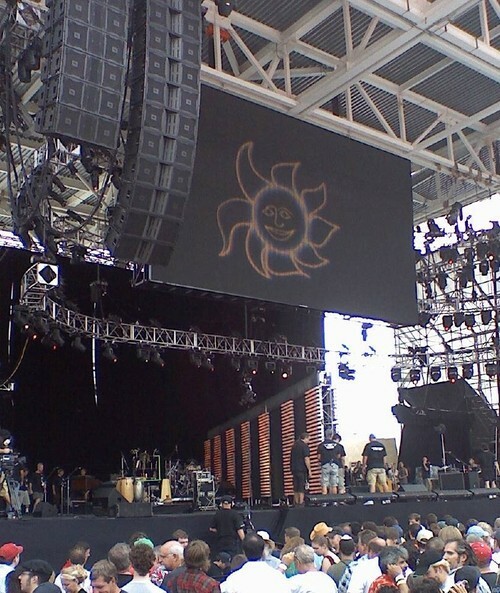 The concert was scheduled to start at noon, with the doors opening at 9:30. We were on the field in standing-room-only "general admission." (All tickets -- assigned seats or standing-room-only -- were the same price: $90. Not bad for 20 acts and eleven hours of world-class entertainment!!) I'd awakened the night before in a cold sweat imagining we were only able to find seats WAAAAAY far back on the field, when of course I wanted to be as close to the stage as possible. Being there in line when they opened the field was a good idea ... we were able to get into the front area they called the "pit" -- an honor only 750 of us early-birds got. All you had to do was be smart enough to get there early and stand in line for a coveted yellow wristband, and you had in-and-out access to "the pit" all day. SWEET!!! We could probably have weasled our way all the way up to the front of the "pit" right in front of the stage, but I noticed there were a small number (15-20?) of CHAIRS built into the back of the fence separating "the pit" from the rest of the field. We found 2 of them available and since I have a bad back and I was very concerned if I would be able to make it through the day standing and sitting on the ground ... I considered myself VERY LUCKY to have a seat, and had no problems surviving the 11 hours! The weather was warm and way more humid than this California girl is used to, but fortunately not as hot as I expected it to be in Chicago in July. The stadium was as beautifully prepared and as well staffed as I've ever seen. It was obvious that this event was a class act. Murray introduced the host of this incredible event, the greatest guitar player EVER (in my humble opinion) ... Eric Clapton. "Crossroads" is the title of a song written by Blues legend, Robert Johnson, which Clapton first recorded with "Cream." It was an appropriate name for the substance abuse treatment center Clapton started in Antigua ... and this event was a fund-raising event for the Crossroads Centre. Clapton is not just an incredible musician, he also managed to overcome drug addition (to heroin, no less) and alcoholism. And now he's making it possible for many others to receive treatment. A very worthy cause. I thought there would be lots of long breaks in the show while bands were being set up and moved around, but I was delighted to find they had a lazy-Susan type, 2-sided stage. While one act was performing, the next act could be setting up "backstage" -- then the stage would spin around, and after just a few minutes to plug things in, the next band would start . I think most of the breaks between acts were only about 5 minutes ... with a couple of breaks during the day of up to 15-20 minutes. WELL DONE! (There were a few incidents of microphones not being properly plugged in when performers began, but those few problems were quickly corrected). 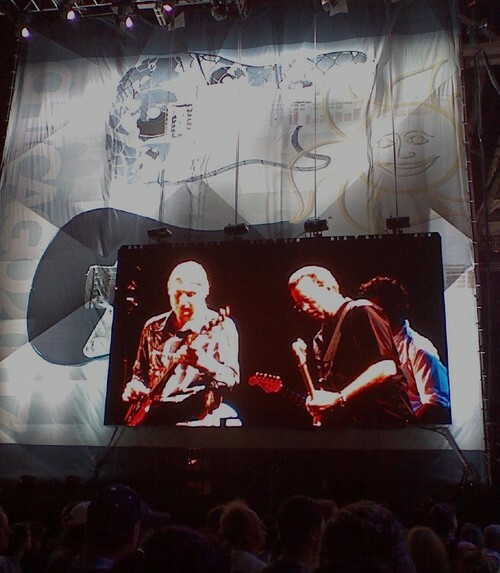 After Clapton welcomed the crowd and thanked us for coming ("NO, thank YOU, Eric!!") ... he introduced an awesome blues guitar player, Sonny Landreth, who recently was honored with a Grammy nomination for "best contemporary blues album." 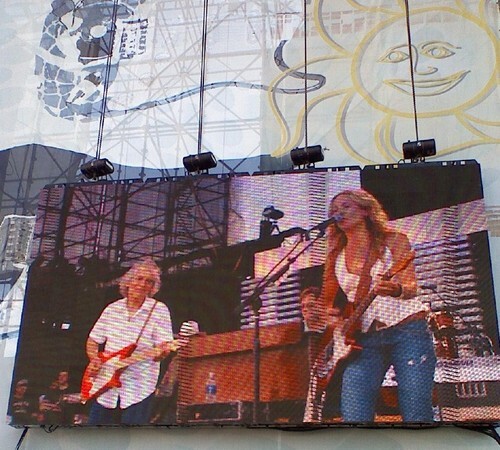 Landreth did 2 songs, then Clapton joined him for a third. Landreth was one of those people I'd not heard of before Crossroads, but afterwards, I decided I must look for one of his CDs! 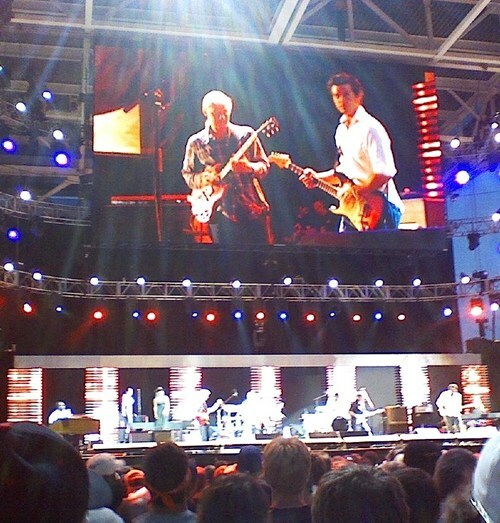 Next up was jazz and "world music" guitar great, John McLaughlin. In his career McLaughlin has recorded with notable musicians -- Miles Davis and Jimi Hendrix, to name just two. McLaughlin and his band did a couple of instrumental numbers. Not really my style of music, but what an incredible musician. Next up was another very talented guitarist Doyle Bramhall II. Doyle has been performing with Eric Clapton for quite some time -- you can see him in Clapton's video chronicling Robert Johnson's career -- "Sessions for Robert J") as well a with his own band. We saw him with Clapton in March in San Jose, CA. 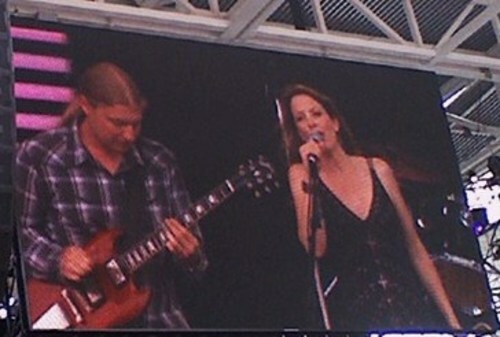 A highlight of the day for this reviewer was the Derek Trucks Band who did a couple of songs before being joined by Trucks' beautiful and talented wife, Susan Tedeschi. WOW!! This is the group I was looking forward to seeing most, and they didn't disappoint. 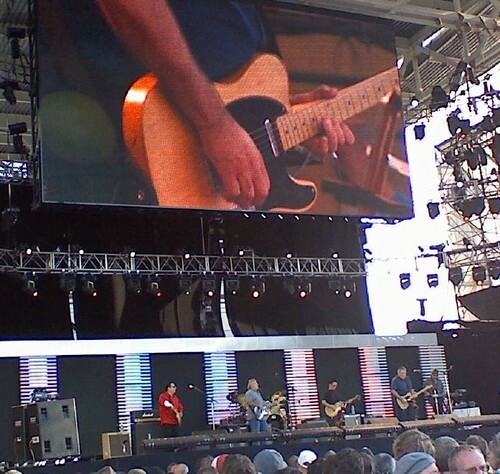 Trucks also performed with Clapton on his recent tour -- we saw him on his last night with Clapton before he left to join his wife Susan for their "Soul Stew Revival" tour. OH MY GOD ... they are my new favorite group. Trucks, who is only about 28 years old (and formed his current band when he was FOURTEEN! ), plays with his own band, has toured with the Allman Brothers, and also with Clapton. He's the best slide guitar player ever. Perhaps I like him so much because of his "jam band" background with the Allman Brothers -- and he's also toured with Phil Lesh, the former bass player for The Grateful Dead (the original "jam band") -- so I really enjoy Trucks' style. We went to see Trucks & Tedeschi at the Fillmore in San Francisco a couple of months ago and I've been wanting MORE -- I'm waiting for them to put out a CD or better yet, a DVD of their Soul Stew Revival tour. 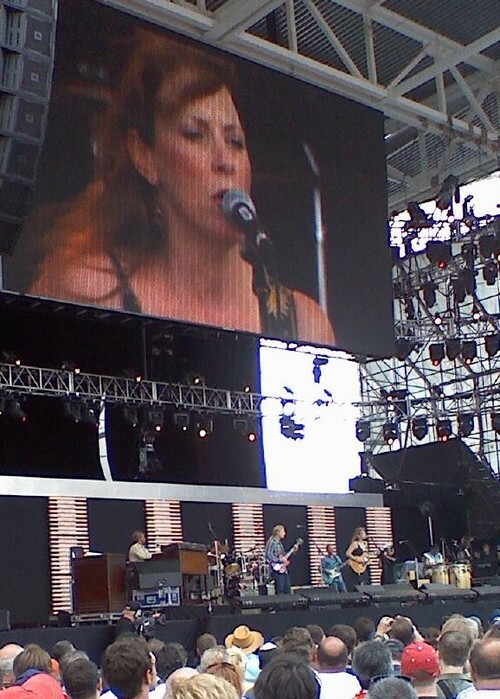 Susan Tedeschi walks out on stage and, first of all, she's gorgeous. I should say they're quite an odd couple -- she's in sequins and high heels, and her hubby is usually in a plaid, long-sleeved shirt (probably the same shirt you saw him in last time) and jeans. But BOY, do they make beautiful music together ... she has got an incredible Blues voice. THEN, as if it wasn't enough that she's gorgeous and has an incredible voice, she picks up her guitar and can hold her own up there on stage with "Guitar Hero" Trucks and his band! This group is HOT, and was definitely one of the highlights of the day for me. 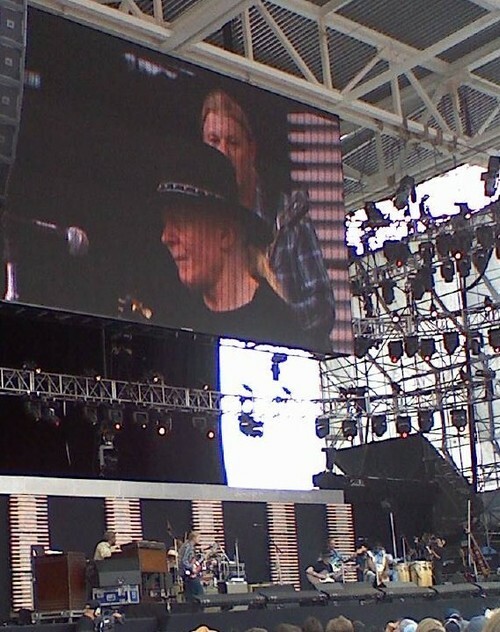 Next, Trucks' band stayed on stage and they were joined by Johnny Winter. Gary was excited to see Johnny Winter, as he'd seen him years ago. 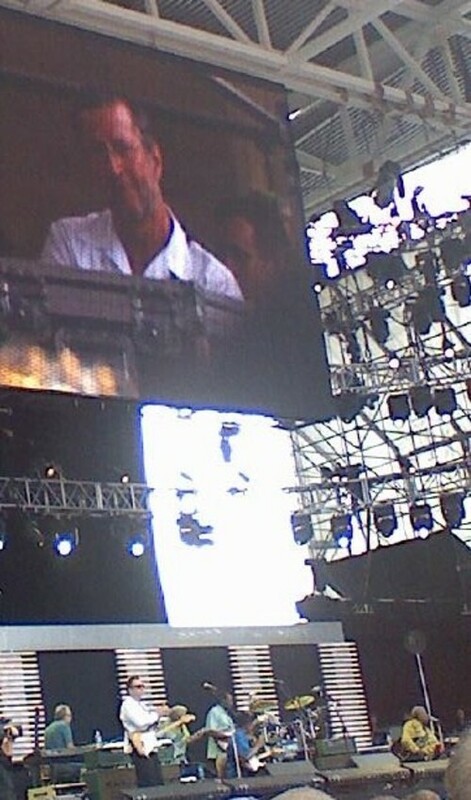 Winter got his start when he was pulled up on stage by one of his idols, B.B. King. B.B. 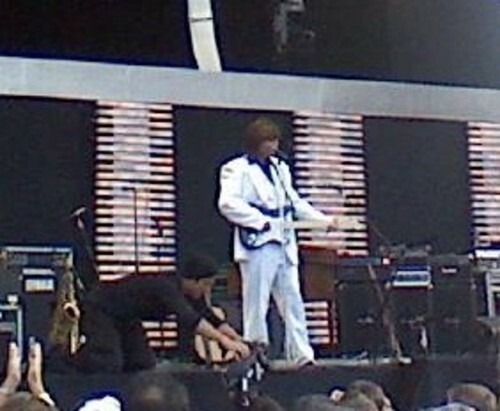 gave Winter his guitar to play, and afterwards, the crowd gave Winter a standing ovation. Winter appears to be blind and not in good health ... what a shame ... but he can really play that guitar! 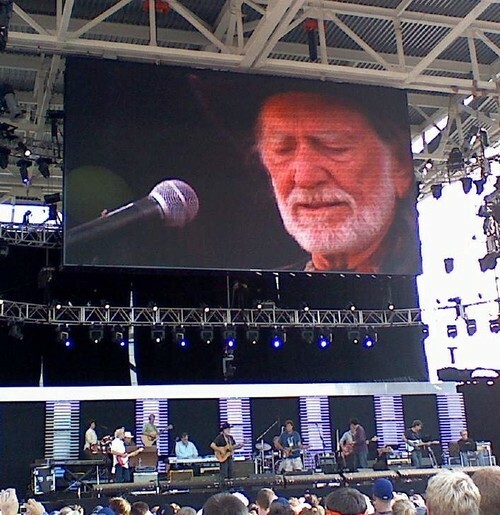 He only played 1 or 2 songs, and left us wanting more. 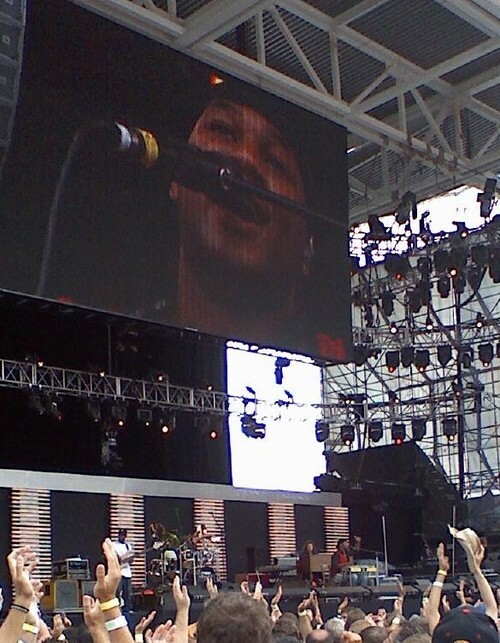 Another spin of the stage and we were treated to a high-energy set by Robert Randolph and the Family Band. These guys are happy and FUN. 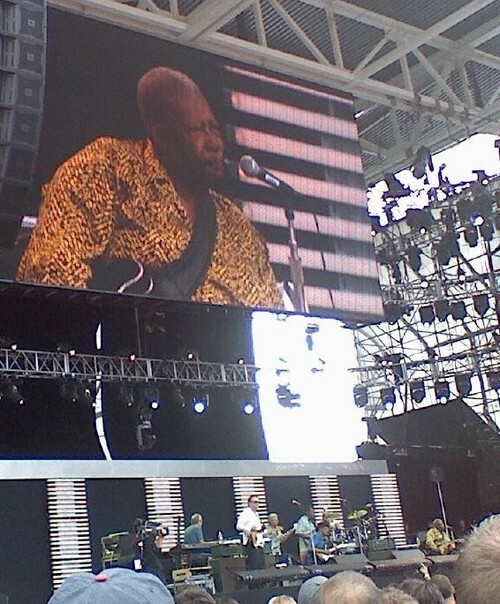 This was the third time I've seen Randolph performing live -- the first time was when he opened for Clapton in 2004. 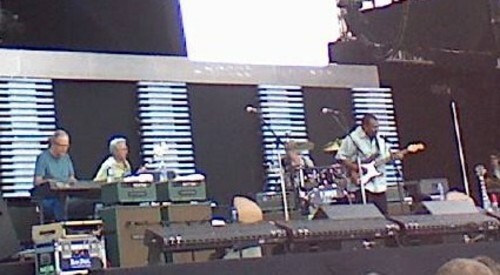 Then Randolph opened for Carlos Santana when Gary and I saw him in September of 2005. Randolph plays a variety of guitars and ... and although I'd never even seen or heard of a dobros before seeing him play one, Robert Randolph is a master!! He's got picks on his thumb and a couple of fingers and uses a slide at times and plays the HECK out of that thing. He is one talented guy, and it appears Clapton has kind of taken him under his wing and is giving him sound career advice. Watch for this guy! Next, we had the wife of the late Blues man Willie Dixon, who introduced The Robert Cray Band. Again, this is a group I've been fortunate enough to have seen performing live twice in the past 2 years ... last summer he opened for Buddy Guy, and in March he opened for Clapton. (In fact, we're going to see him again, with Keb Mo, in a couple of weeks!) He's got a rich, beautiful voice and a very talented band. 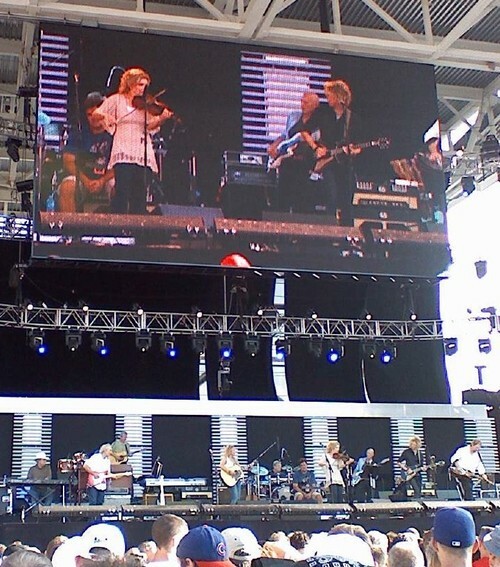 NOW KEEP IN MIND I had to rely on the big screens to get close-ups of some of these performers as I was just a "regular person" with a cell phone camera (that you can take anywhere with you) and no special press access at this event! Pretty darned good photos! 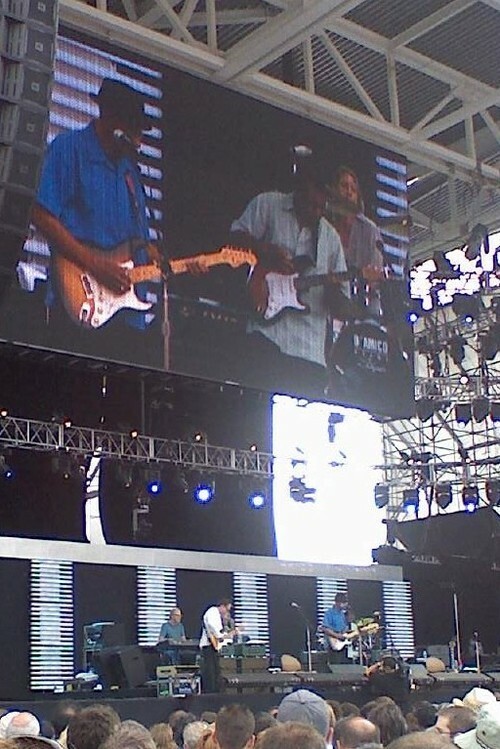 Jimmy Vaughan and Robert Cray and his band were then joined by yet another Blues legend, Hubert Sumlin. Sumlin played the guitar you hear on Howlin' Wolf's recordings as a member of Wolf's band. Keith Richards (of a little band called The Rolling Stones), considers Hubert Sumlin one of the greatest Blues guitar players, and recorded a song with Sumlin. 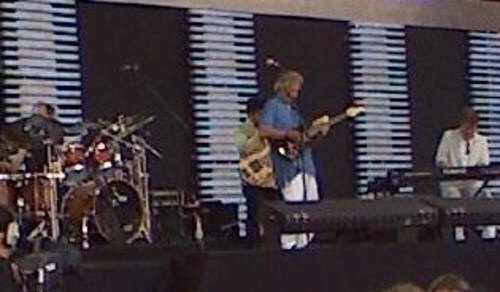 OK, now we've got 3 Blues legends on the stage ... can you handle one more? 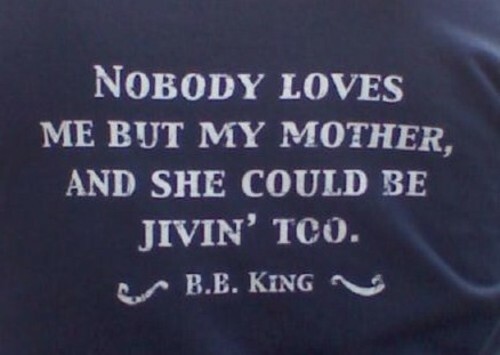 They were joined by none other than "The King" -- B.B. King. This guy is 81 years old and moves slowly, but DAMN, can he play that guitar and SING. He has the most expressive voice, and he makes that guitar sing as well. B.B. King is in a class by himself. Bill Murray came out with big hair and a slick suit and asked the crowd how a big-haired guy from CONNECTICUT could possibly sing & play the blues?? 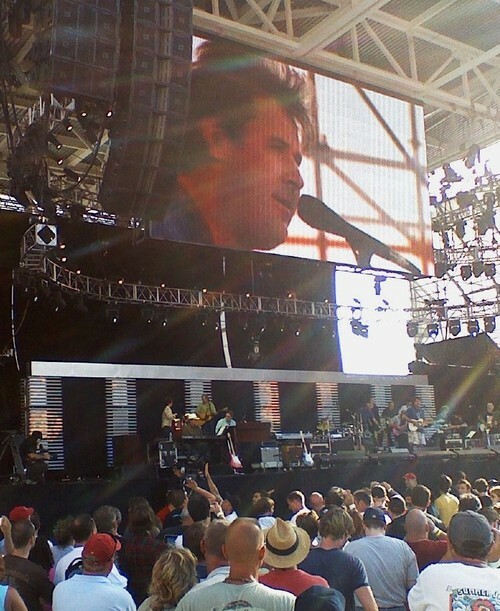 I was very impressed with Mayer when I saw him opening for Phil Lesh & Friends on New Year's Eve 2005 in San Francisco. I must admit, I became VERY CONCERNED about him when I read he was dating Jessica "Chicken of the Sea" Simpson! Apparently that phase of his life has passed. Whew!! But there's no denying that the ladies love this guy ... there was a woman standing near me who was probably old enough to be his mother, and she was standing with her husband as she screamed at the top of her lungs, "I LOVE YOU JOHN!!!!" (over and over ... and over). 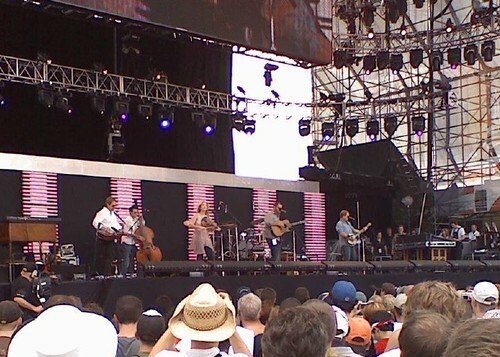 NEXT, it was Vince Gill. This guy is another incredible musician who can do it all. 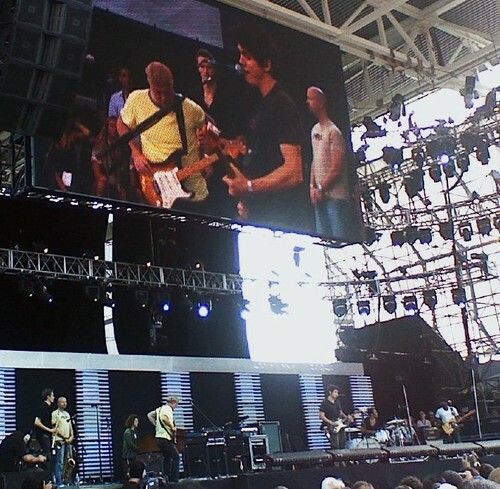 Vince Gill was then joined by one of his musical inspirations, a guitar player (what else) named Albert Lee. Lee has toured with Clapton, Emmylou Harris and the Everly Brothers, and is also a Grammy award winner, and has (5 times) been voted the Best Country Guitarist by Guitar Player magazine. This is another guy I'd not ever heard of, but afterwards I vowed to find some of his music and buy it! 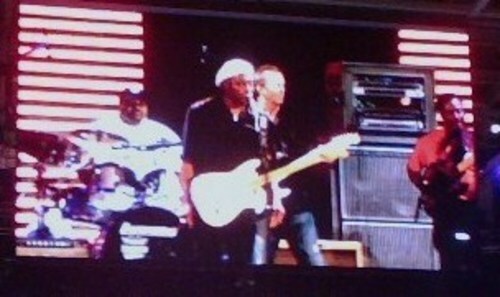 Clapton finally came out on stage again during "the country segment," joining Gill, Lee & Crow for "Living on Tulsa Time." Clapton and Crow left at that point, and we were treated to a couple of songs by the legendary Willie Nelson, with Vince Gill & his band and Albert Lee backing him up. 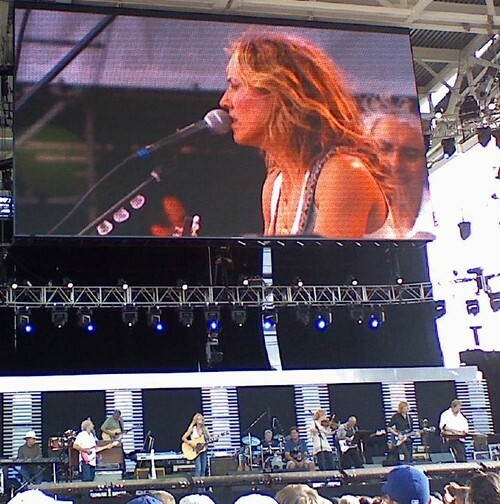 Sheryl Crow came back out and joined Willie for "On the Road Again." And now for something completely different ... Los Lobos. Also very high energy and entertaining. Trucks and Clapton ... HOT, HOT, HOT!!! Robbie Robertson then came out and joined Clapton & his band. Robertson was a member of Bob Dylan's band ("The Band") which toured and recorded on their own in the 60's and 70's and became very big. "The Band" was also on the "Festival Express" with the Grateful Dead, Buddy Guy, Janis Joplin and others -- TiVO it! These days Robertson doesn't perform a lot, but he produces, and composes for movie soundtracks (including Shrek, Any Given Sunday and Raging Bull). 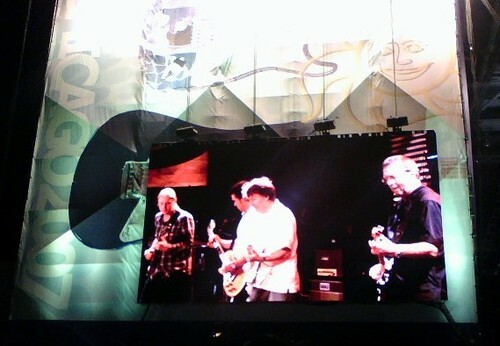 Next, Clapton, Robertson, Trucks, Bramhall & Clapton's band were joined by ... Steve Winwood. This was a real treat. Did you know Steve Winwood, in addition to having a great voice, plays drums, keyboards AND guitar?? I knew of Steve Windwood from the band "Traffic," and his more recent solo hits, but I had no idea he and Clapton were in a band together in the late 1960's called "Blind Faith." 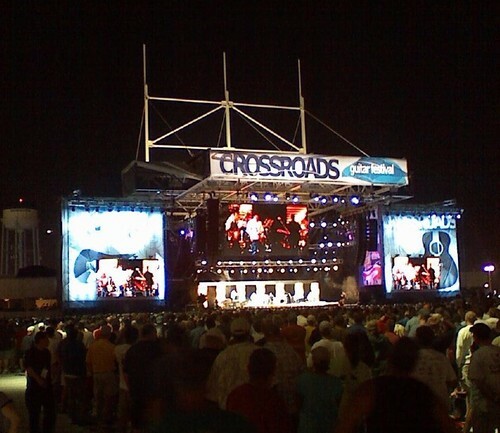 Much to the crowd's delight, Clapton and Winwood had a little Blind Faith "reunion" at Crossroads. 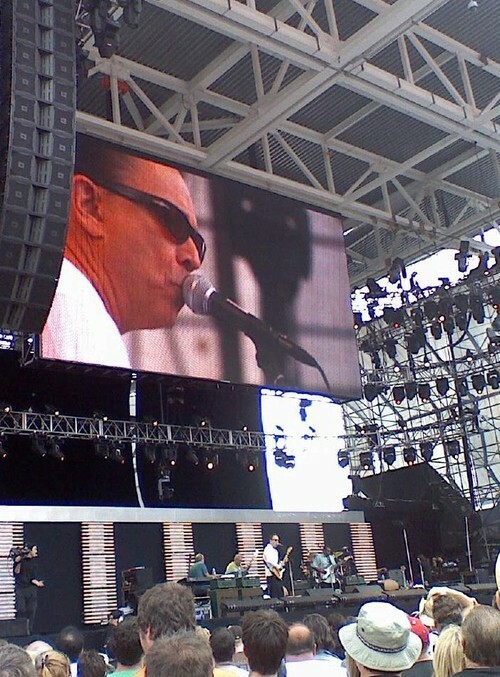 Next, Steve Winwood performed a couple of songs with Clapton's band backing him up. 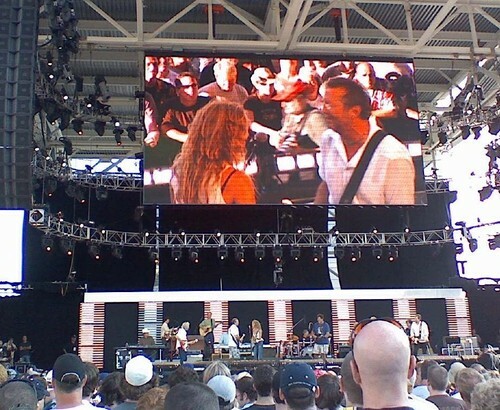 Clapton then came back on stage to join Winwood for "Cocaine" and "Crossroads." 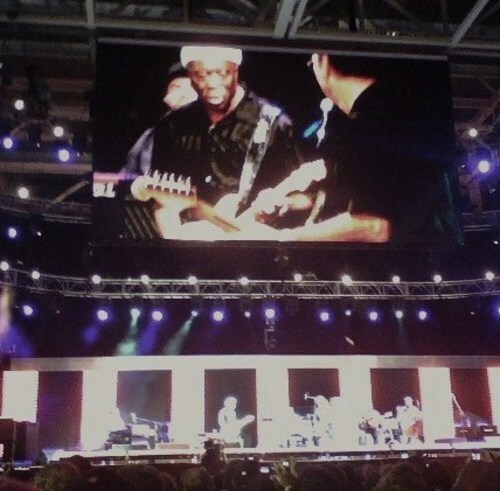 The honor of the closing performance of Crossroads Guitar Festival went to Chicago Blues man and Clapton idol ... Buddy Guy. I raved about Buddy in my previous review of the show we saw at his Blues club, "Legends" -- this guy is one of my favorite performers. For the Grand Finale ... 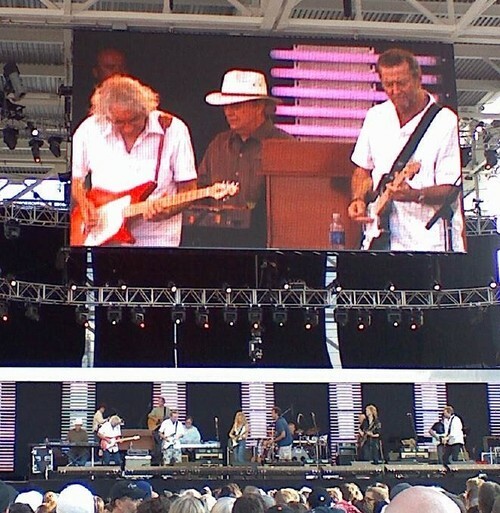 Buddy called for any other performers who wanted to come out and join them, so there was Guy, Clapton, Robert Cray, Jimmie Vaughan, Hubert Sumlin, Johnny Winter came back!, and John Mayer ... among others ... to do ... what else? 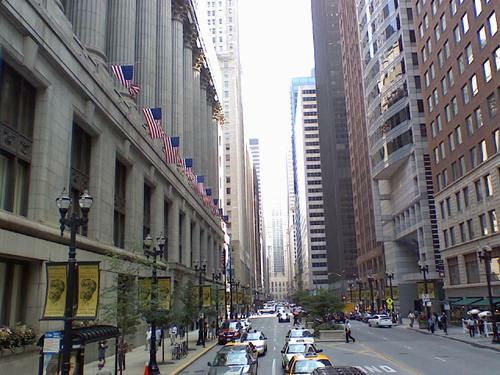 ... "Sweet Home Chicago." Now I think that was supposed to be the last song, but they must have ended ahead of schedule. John Mayer looks at his watch ... it's 10:49 PM so he says, "TIME FOR ONE MORE SONG!" The crowd was begging for more ... yes, even after 10 hours and 49 minutes of nearly non-stop world-class music, nobody was ready for this show to end. But end it did, right on schedule at 11:00 PM. Although I've tried, this is an event which just defies description. I can't quite believe I was actually THERE. It was definitely the musical highlight of my LIFE!! (Well, so far!) :-) Thanks to Billboard & LG for giving me the opportunity to share my experience. Excellent blog. Definitely once in a lifetime experience! Being right there with all that unbelievable talent! Thanks for the fabulous coverage and all the background info on the artists. What a great summer vacation memory, huh? I'm posting this from Mazatlan, Mexico. After reading your blog I was drooling...! How lucky you are on having those unbelievable shows so near to you. Eric Clapton has been my guitar god since I was a teenager (I'm sixty now). Thanks, Lesley. You did a great job! Looks like you guys had an awesome time! Thanks for sharing your adventure and the fantastic photos. It sounds like I'll probably need to update my CD collection based on some of your recommendations. 1. 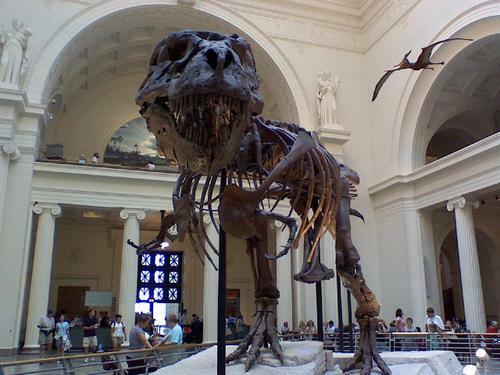 Why in the world would anyone name a dinosaur "Sue"? 2. Why would a dinosaur hang out in Chicago when EVERYONE knows that Drumheller, Alberta, Canada is THE home for dinosaurs in North America? It was an incredible life-time experience and your review reflects the feelings of the majority of those who attended. Wait until the DVD comes out, we can rock again! Wow! What a cool trip! That looked like an awesome concert with tons of cool artists. Nice pictures! I like the dinosaur. What an musical event of a lifetime. Your writing style is wonderfully expressive and informal, like having a chat with you. I only knew of a few performers, but liked the introduction to news ones. I will keep my eye out for Susan Tedeschi and Trucks band. Thanks also for identifying some of the historical singers with other bands with whom they used to perform. Great review! What a cool trip, Im jealous! This sounds like such an amazing concert. I really enjoyed the pictures from the other places you visited. You had a great review that was really easy to understand and picture myself. That was a great review, but you didn't know Winwood and Clapton were in Blind Faith?! Wow. Wonderful overview, pics and writing style...it made me feel like I was there. I wish I had been! Hi Lesley Loved your comments. Wish I were there. Eric Clapton is on my iPod. Love his music! WoW!!! your review and pictures were *almost* as good as being there (well, BEING there really would have been better) - but I enjoyed reading your take on it! Glad you had a great time! Lesley's blog rocks! The pictures make you feel like you're sitting in the audience. The narrative fills you will the desire to see them for yourself at the next opportunity! Billboard rocks! Once again you've outdone yourself, Lesley! Excellent review and great pics!! You really do need to check out Sonny Landreth's cds, one of the best is his live one Grant Street. His part of Crossroads was too short (for me). I can't wait until he comes to Seattle/Tacoma in November, I already have tickets to the Seattle show and hopefully will get for the Tacoma show! His playing is amazing and watching his hands is mesmerizing. Ossieboo these are fantastic photos on your camera phone and a righteous run down of your journey! You & Gary had it going on in Chicago for this legendary guitar summit, you were lucky! Great to meet you both at The Field, hope to see you Further On Down the Road! What a great review. Made me feel like I was at the concert too. The *very first* album I ever owned was Clapton's 461 Ocean Boulevard (Thanks Pappy!). Hard to belive those photos were taken with a CAMERA PHONE! I've switched back to a basic phone because the camera phone I had wasn't worth the effort. Your photos show that doesn't have to be so. What a great blog. I felt like I was there in Chicago, the birthplace of **electric** blues. 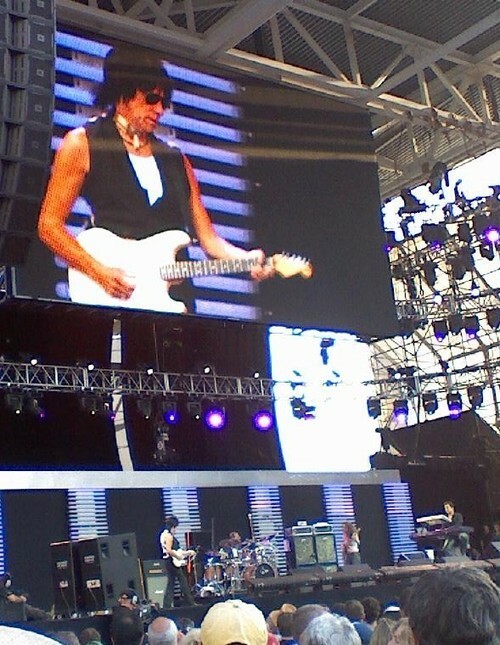 Wow, after reading your blog and seeing the pictures I really felt like I'd been at the concert ! Sounds like you had a fabulous time. Billboard should hire you as a concert commentator !! Looking forward to more of your reviews. WOw, Wow, Wow - I'm so jealous. The pictures are great too! So happy that you got to go. Loved the commentary. What a fantastic trip!!! Thank you for the wonderful commentary and awesome photos ( did you really use a camera phone???????) I really felt like I was there too :o) You have a natural gift of storytelling. Great review! Here are some recommendations regarding some of the artists you saw. Although last year's Albert Lee record 'Road Runner' is not too shabby, I would highly recommend tracking down his 1979 release 'Hiding', which contains the jaw-dropping opening track 'Country Boy'. Doyle Bramhall II is son of Doyle Bramhall I, who was a close friend of Stevie Ray Vauhgn, wrote or co-wrote songs with SRV and was credited by SRV for teaching him to sing. Doyle II released a record simply titled 'Doyle Bramhall II" in 1996 that was produced by Wendy & Lisa of Prince's band and is well worth seeking out.